Paris. Milan. New York. Franklin, Illinois? Aspiring design mogul and reluctant mob princess Lucie Rizzo dreams of taking the fashion world by storm. As the wisest of wiseguys will tell you, to go big, you have to start small. And a local charity fashion show provides the perfect chance to shine the spotlight on Coco Barknell. Not to mention the opportunity to work with the Don Corleone of pet products, Buzzy Sneider. But she didn’t earn that rank by being nice. Buzzy expects everyone to kiss her ring. When Coco Barknell designs start appearing on Buzzy’s website, Lucie wants to wring her thieving neck. Until somebody beats her to it. 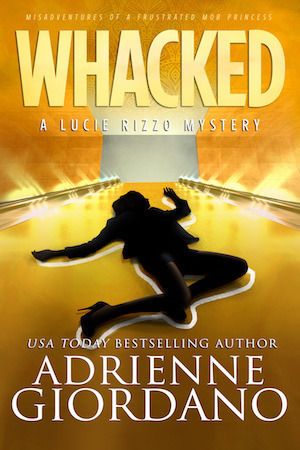 A dead celebrity plus a very public feud can only add up to trouble for a girl named Rizzo. Except it’s not Lucie the cops put behind bars, but her BFF—hotheaded creative diva, Roseanne. The evidence may be stacked against Ro, but Lucie and her zany crew will never let her go down without a fight. Some animals were just not built for bathing suit modeling. Lucie watched her favorite client, an Olde English bulldog named Otis, lumber down the runway toward her. His big body moved with the speed of a snail, while the attractive blonde holding his leash did a slow-mo version of the strut only experienced models could pull off. Otis stopped to lick his parts, the ones squeezed into a too-tight swimsuit, and the blonde looked over at Lucie, her pretty face twisting into a mass of panic and confusion. Lucie sighed. Already two hours into this ordeal, she sat on a director’s chair in the middle of a hotel ballroom for the latest round of doggie auditions. They’d been at it since eight a.m., and Lucie’s mid-morning sugar craving kicked in. Or maybe she simply needed chocolate to get her through this nightmare. Beside her, Roseanne, Lucie’s BFF and Coco Barknell’s vice president of sales, furiously jotted notes about each of the prospective models. Stubby legs. Long neck. Big head—all of it on paper for future deliberations. Deliberations that would surely force Lucie to poke her eyes out. Who knew finding canine models for a charity fashion show could be so difficult? Ro laughed. Of course she did. They both knew Ro’s designs didn’t run small. Otis was simply a big boy. Day four of auditions wasn’t going so hot. The biggest issue was fitting the dogs for Ro’s unforgiving designs. An extra pound here or there would throw the whole ensemble off. Fifteen doggie outfits needed models. They’d already gotten lucky and managed to fit two dogs with multiple outfits—thank God for V-necks and belts. But they were still short six dogs. A yip, followed by an “ouch” came from behind a rolling screen that doubled as a curtain. A round of barking and growls followed, and Lucie clawed her fingers into her scalp. “Is everything all right?” she called. The screen fell over and five dogs leaped on top of it, two of them tugging free from the models holding their leashes. The two dogs shot by Lucie and Ro, and Lucie swiveled around to track them. A few volunteers stood behind them waiting for assignments. One of them sidestepped, blocking the dogs’ path. Both animals skidded to a stop. Just like that, bam. A spurt of jealousy rose inside Lucie. One day, she’d have that obvious command over these animals. Now? Not so much. When they saw Lucie, they saw fun and playtime and love. The volunteer walked the dogs back to the once-again-erect screen, and handed the leashes off. Buzzy Sneider, Lucie and Ro’s much more famous partner in this charity gig, and her assistant slipped into the ballroom via a side entrance. The pet product mogul had more damned assistants than the president, but Reece seemed to be the most senior of the bunch. Please don’t let Ro see them. Buzzy’s claim to fame came from designing custom dog houses for celebrities and the filthy rich. In the animal world, she carried a lot of weight. If she endorsed a product, it immediately broke sales records. The problem was, Buzzy had decided to expand her empire to dog accessories and clothing, acting as if she'd created the industry Lucie and Ro had been operating in for nearly a year. In short, Ro wasn't happy about Buzzy’s expansion. Neither was Lucie, but, as the levelheaded half of the dynamic duo, she’d taken the high road and approached Buzzy to partner with Coco Barknell for the fashion show. Buzzy's mass appeal could only help spread the word about an exceptional non-profit that provided service dogs to people in need. And, oh, right, Coco Barknell. Lucie peered beyond Ro, where Buzzy stood reviewing a clipboard while her assistant waited for the queen to rule. Poor Reece. In every meeting, the girl had been given a list of tasks that would take a team of twelve to complete. Buzzy, in her infinite wisdom, obviously had no issues nearly killing her staff with work. Still, Reece handled it all with grace and a steadfast attitude that Lucie admired. Dark hair whirled and the click of spiked heels sounded as Ro headed for Buzzy. “Ro!” Lucie hopped off the director’s chair, narrowly avoiding a faceplant. One thing they didn’t need, no matter how righteous, was Ro beating the crap out of a television queen. Drama, drama, drama. All because, two days after Lucie and Buzzy signed the fashion show contract, one of Ro’s designs turned up for sale on Buzzy’s website. A mistake, Buzzy claimed. A simple oversight by her staff. Disregarding Reece, Buzzy offered a smile that packed a whole lot of prowling lioness behind it. Still, her pixie cut blonde hair and sparkly blue eyes gave her a look of innocence that Lucie found off-putting for a mogul. fell over, landing with a smack that echoed and strained Lucie’s last millimeter of patience. She angled back to where two of the shelter dogs rolled over each other, offering up play bows on top of the screen. “People love it.” Lucie blurted. “And not yours,” Ro said. Yikes-a-roo. So much for Lucie handling it. Human error, Lucie understood. But in a company the size of Foo-Foo Entertainment, each product went through several reviews and approvals before being put on sale. And Lucie, as forgiving as she liked to consider herself, wasn’t buying human error at every interval. Still, in an effort to salvage some sort of working relationship—and get through the fashion show—Lucie had given Buzzy a week to get it sorted out. Now Ro stepped forward, a determined fire sparking in her coffee-brown eyes. Between her long legs, curves, blazing sense of style and a face fit for the cover of Vogue, Ro tended to command space. Sometimes, it was scary as hell.